I don’t use food or toys when training foundational obedience. Don’t get me wrong. I am not averse to using either when it is appropriate. For instance, there’s nothing wrong with starting off using food with very young puppies. Using food can be useful for gaining trust with new, shy dogs. And when it comes to higher levels of training—much of which is trained by harnessing a dog’s drive anyway—I will use whatever works for the dog. However, when it comes to training the basics, food and toys are not just completely unnecessary, they can be downright counterproductive. Unfortunately, today there is this idea that dogs must be “paid” to perform a behavior. The thinking goes like this: You wouldn’t go to work unless you get a paycheck; why would your dog? The problem with this attitude is that it’s just plain wrong (not to mention incredibly depressing). In this article, I’m going to talk about why. There’s a reason that I refer to Nitro K9 training as bond-based. Anyone who goes through the program knows what I’m talking about; they have dogs that are attuned to them, who gaze at them adoringly, and who work for them happily. They don’t work because they get a piece of food or a tug on a toy. They work for love. You see, many thousands of years ago, various groups of wolves (more likely ancestors of today’s wolves) decided it was a good idea to hang around people. It was a mutually beneficial relationship; they got things like food and shelter in return for stuff like protection and hunting. And more than any other animal, dogs are bred to work and live cooperatively with us. This is hardwired. We are part of their pack. They look to us for approval and guidance. I have been working with dogs for more than 30 years, and I can tell you with utmost confidence: All dogs really want to do is to please us. Let me say again, I don’t have a problem with limited use of food for puppies or young dogs (phased out quickly) or toys at higher levels of training. But when it comes to using them to train basic obedience, they just get in the way. Here’s how it works. At first, food and toys seem to work. People get an instant sit when they’re holding a piece of food or if the dog knows that it’s coming. That sit happens really fast when the dog knows a toy reward is coming. But eventually, it starts breaking down. It breaks down when there’s something more exciting to the dog. It breaks down when the food or toy is not available. The fanny-packers then start making everything really complicated, throwing around words and phrases that make even experienced dog peoples’ eyes start glazing over: Variable reinforcement schedules! Pre-Mack! Here’s a tip: the fancier the words someone uses, the less likely they are to show you measurable results. It’s really not complicated. Dogs want to be with us. They want to interact with us, and they want our approval. And that leads to the bigger problem: food and toys are external motivators that take the focus of the dog away from the handler. Look at any YouTube video where some “rewards-based” trainer is telling you to use food or toys. Follow the dog’s gaze. Are they looking at the handler—or are they looking at what the handler is offering? Even if the reward is not visible, you can see quite clearly, that most of the time, the dog isn’t looking at the person’s face. Nope, he’s looking at the hands. This is not engagement. Do you really want the kind of relationship where your dog only does what you want for the promise of something that has nothing to do with you? One of the things I say over and over in every article is that dogs think by association. The food bowl means dinner. The leash means walk. Let’s break this down a little further. The reason that dogs think by association is because they live in the moment. They’re not capable of reasoning, the way that people are. This is why trainers talk about the importance of timing. You have to praise in the moment, and correct in the moment. It’s also why we talk about repetition; the more you do it, the stronger that association becomes. The other issue is that both food and toys can amp excitement levels, which is particularly problematic for toys. Why? Because dogs do not learn the same way when they’re in drive as when they are calm. They are in a heightened state of awareness and excitement. Now, if a dog is trained to—let’s say—heel using the promise of a toy reward, two things happen. The first is that the association the dog makes with heeling is being in drive. You see this a lot with IPO dogs who do super precise obedience routines. Yeah—it looks awesome on a training field, but how do you get the dog to heel when NOT in drive when you’re walking past a squirrel? I think you see the problem there. The second is that using drive to train basic behaviors invariably leads to the dog developing an unhealthy obsession with the toy. In many cases, this obsession can also lead to resource guarding. The real problem: humanizing dogs. In my last article, I talked about how dominance deniers are doing real damage to our dogs by being blind to their fundamental nature. This is true when it comes to understanding how dogs communicate, and it’s true when it comes to understanding how to work with them. The big elephant in the room here is the role of corrections. Positive trainers think all correction is bad, to be avoided at all cost. Many “balanced” trainers seem to think the same way. There’s so much focus on which operant conditioning quadrant something falls into. Is it positive reinforcement? Is it positive punishment? No, it’s negative reinforcement! Or wait, is it negative punishment? The whole construct around “modern” and “scientific” dog training is set up around an artificial binary of “good” and “bad.” People endlessly discuss what is “least invasive and minimally aversive,” they quibble over when corrections should be introduced, the argue over what is aversive and what is not. It’s all incredibly silly. Dogs aren’t people. They understand hierarchy and operate best within one. They need their owners to be their leaders. And as part of that, they need people to give them clear feedback. YES, do more of this. NO, do less of that. Dogs do this easily with each other all the time; the language is clear and unequivocal. What does this have to do with food and toys in training? It’s simple: there’s NOTHING clearer to a dog than direct interaction—pets, love, praise, eye contact—as a YES, do more of that. Similarly, there is NOTHING more clear as a NO than a simple correction. And let me clarify that the goal of correction is not to punish; it’s to change a behavior. There is absolutely nothing negative about a gentle leash correction, using the correct amount of leash pressure for that dog. Properly done, a correction is simply information. Put together, you get a complete system of talking to dogs in a way they understand. It’s YES and NO. It is clear and uncomplicated. That’s what being a leader is all about. Relationship works for all dogs because that’s what all dogs want. That is their genetic makeup; it is why they’re dogs and not wolves. And the greatest respect and love you can show them is to speak their language. These days, saying you don’t use food in training has become akin to abuse. It’s a shame. I’ve been doing this a long time. I’m always refining my approach, and I’ve done it all (even clicker mainly positive training). I can tell you right now: I see the difference. More importantly, my clients can see the difference. There is value in what some would call “old school” training done kindly, properly, and looking straight at the dog. And yes, of course, there are always going to be people who got past the initial food training and have fantastic relationships with their dogs. The point is—food and toys are completely unnecessary, can create extra work getting to that point, and often create problems of their own. 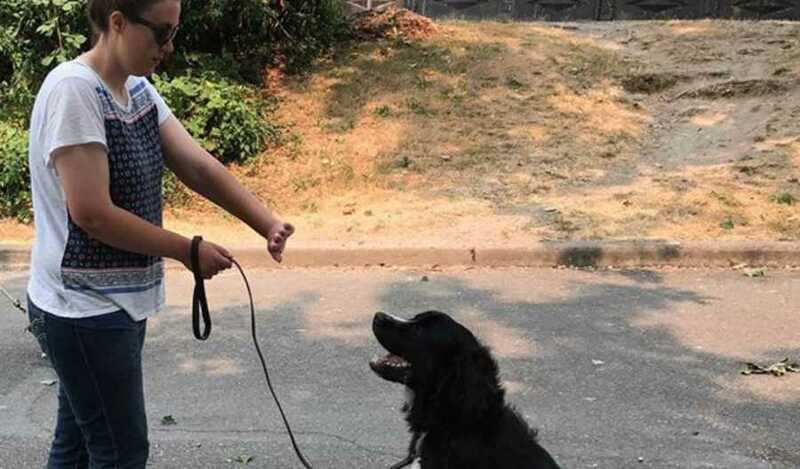 It is immensely sad to me that so much of dog training has become a cold, transactional process of trading a piece of food for a behavior, or needing to get a dog into drive to heel. Dogs will work—and they work best—for our love, praise, and approval. If you tap into that, you’ve got the most powerful motivator of all.